Excuse me if I’m a little pissed off. Not to mention more than a little heartbroken. On Wednesday, I found myself in a room filled with LAPD traffic investigators to discuss bicycling issues in the City of Angels. 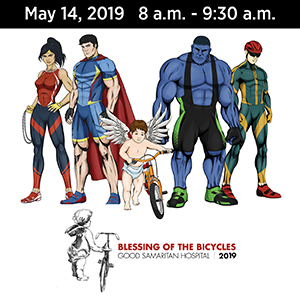 And not one of them mentioned that yet another L.A. cyclist had joined that heavenly host as a result of a careless driver. Maybe there’s a lack of communication within the department, and the people who should be first on the list to be notified about bicycling collisions — the bike liaisons representing the four Traffic Divisions, each of which was represented at that meeting — aren’t. But either way, a bike rider has been dead for a full week as a result of a Hollywood dooring. And we’re just finding out about it now. According to a press release from the LAPD, a 49-year old Los Angeles resident, who wasn’t identified in the release, was riding his bicycle in the southbound bike lane on Vine Street near Banner Avenue at 6:30 pm on Sunday, March 3rd, when a driver opened her car door into the bike lane. The rider reportedly collided with the door and was thrown into the roadway. LAFD paramedics responded to the scene and took the victim to a local hospital, where he died of his injuries five days later, on March 8th. The driver is identified only as 26-year old resident of L.A. in a 2009 BMW 328i. Police cite unsafe opening of a car door as the primary cause of the collision; drugs or alcohol do not appear to have been a factor. The press release does not mention the nature of the victim’s injuries or whether he was wearing a helmet; however, this is exactly the sort of collision in which a helmet might have made a difference. The description of the incident suggests that the victim most likely suffered head injuries as a result of hitting the pavement; falling to the street after colliding with a car door is unlikely to result in fatal injuries to other parts of the body, though it is possible. 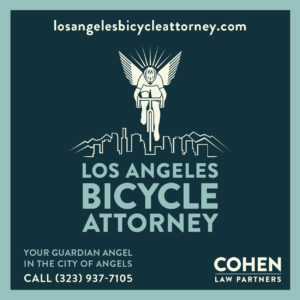 While dooring is one of the leading causes of bicycle collisions, both here in Los Angeles and elsewhere, it seldom results in fatal injuries. 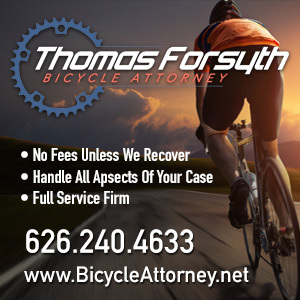 In fact, of the 145 bicycling fatalities in Southern California in 2011-12, only two resulted from a rider getting hit with a car door. 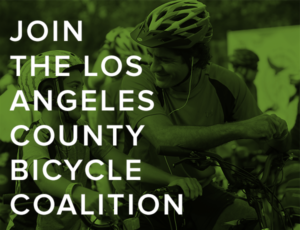 This is the seventh bicycling fatality in the seven county Southern California region this year, compared to 10 this time last year, and the fourth in Los Angeles County. Heartbreaking news. As far as we know, is this the first bike fatality in LA city limits in 2013? Yes, it’s the first I know of this year. I ride this stretch of Vine Street often, and there are no bike lanes on either side, only sharrows. As you can see from the Google street view, if there are cars parked in the parking lane, there really isn’t enough room for a bike and a car in the right lane. The cars can go pretty fast, even when I ride during off-peak hours. The cyclist must have been unwilling to take the lane in the evening (it was dark at 6:30; possibly he had no lights), and ended up taking a chance on the door zone. If drivers seem especially in a hurry, I sometimes go back and forth onto the sidewalk; unlike Vermont Avenue, Vine Street is not somewhere I ALWAYS feel comfortable taking the lane – and during rush hour it’s worse. I hate to say it, but this is an example of questionable planning: the sharrows direct cyclists onto the street, but the traffic isn’t calmed appropriately for them to take the lane. The LAPD press release didn’t use the word “accident” to describe this criminal violation of CVC 22517… until the very last paragraph. Good job, LAPD! You’re improving! Our prayers go up for thr family and friends of the victin. My thoughts and prayers go out to the family. Is there a place where we can maybe discuss the wisdom of encouraging bicycles to ride in between 35+ mph traffic and parked cars? I see these bike lanes and sharrows getting installed in places that really aren’t bike friendly. The experienced, hard-core riders will be fine on those roads with or without markings, but they’re probably going to do more harm than good with everyone else. Actually, that exact conversation has been ongoing for the last several years, with the development and adoption of the 2010 Los Angeles Bike Plan. The city just finished a round of public meetings to discuss new bike lanes for the first year of five year construction plan. The next meeting I know of will be held on March 27th to discuss lanes planned for Northeast L.A. I have to disagree with you, though. Every single study I’ve seen shows that bike lanes reduce injuries for cyclists, as well as other road users. In other words, bike lanes make streets safer for everyone — not just cyclists. There is, however, a need to design the bike lanes properly in order to keep riders out of the door zone. One thing missing from your comment is that bicyclists are already riding on our streets in ever increasing numbers, and unlikely to stop any time soon. So we either find a way to accommodate bikes, or continue to needlessly put riders at risk. Right now, most have no choice but to ride in the traffic lane in front of often impatient and distracted motorists; bike lanes benefit everyone by moving bike riders into their own space and out of the way of vehicular traffic. Your comment also assumes that many, if not most, motorists are incapable of driving safely, which is something I refuse to accept. The simple fact is, it’s actually hard to have a collision. If you drive safely and obey the law, and I ride safely and obey the law, it’s almost impossible to have a wreck. The problem comes when we take driving, bicycling or walking too casually, needlessly putting ourselves and others at risk. In this particular case, a man is dead, not because of the bike lane he was riding in, but simply because a woman was careless and failed to look before opening her door. Dooring is the easiest type of collision to avoid — all you have to do is look before opening your door. I’m well aware that it’s hard to have a bike collision as someone who has biked in and around urban areas most days of my life for the last 35 years or so, and has never had an accident. I’ve successfully coached a lot of people way less experienced than myself into a level of comfort biking on streets. I’m also well aware of the 2010 bike plan and the recent EIR, and that’s where my concern comes from. I was at the Complete Streets conference recently and attended a panel where Prof. Peter Worth presented some data about his findings, some of which I found quite interesting. A couple of items of note were that (1) the odds of a bicycle/car crash ending in a fatality at 25 mph and below is near zero and then climbs very quickly to 80+% once you get above 40 mph; (2) the vast majority of bicyclists sense this and are extremely reluctant to bicycle anywhere near cars traveling at those speeds and above, bike lane or not. His basic conclusion was that any street with more than one lane of car traffic in each direction is by definition bike unfriendly, no matter what you try to do to it (short of cycle tracks of course). Now, I bike to work in the Crenshaw District. We recently got a bike lane on MLK between Rodeo and Marlton. This stretch of road never has significant traffic congestion, yet DOT chose to leave it as three lanes in each direction with parallel parking on the side (on part of it), and then sandwich in the bike lane flush against the parked cars. Why? What’s even crazier IMHO is that there is a parallel route (Coliseum-Santa Rosalia) that also gets you around Rodeo (which is horrific for bikes) and although it has no bike infrastructure whatsoever, it’s actually a very pleasant place to bike (I ride it everyday, and would recommend it to anyone, no matter how novice). So my question would be, why spend scarce resources putting in bike lanes in a place where they are mere inches from serious injury or death on both sides, and which begins and ends on even worse places to bike (Rodeo and Crenshaw, I can sort of understand the logic of a lane like that connecting places that are much more bike-friendly), when one block away, there’s a parallel route, with one lane in each direction, shade trees, tons of space in between the moving and parked cars, lower speeds, no traffic congestion, etc., but no bicycle infrastructure at all? Yes, in the 2010 Bike Plan, the Coliseum/Santa Rosalia alternative is marked for some improvements somewhere down the line, but I would think it would be much more successful to turn an already decent bikeway into a great one, than to turn an extremely bike unfriendly street connecting even more bike unfriendly ones into something just slightly less so. Perhaps because once the general public sees the demand, and the ghosts of the John Forester cult can be removed from the MUTCD and the AASHTO manuals, we might see Dutch and Danish style bicycle ifrastructure? I agree with Ted; The bicycles are here, and increasing every day. Shall we continue to ignore their presence? In response to your point about parallel bike facilities, I think it’s great. Unlike most drivers who feel as comfortable as one another driving on most roads, people on bikes represent a lot of different needs and desires. Having a calm but less direct neighborhood route next to a more efficient but higher trafficked arterial route allows people to choose for themselves which one they prefer to deal with, which even changes for an individual depending on their needs for any one trip. Another point worth making is that busy streets a busy for a reason, because that’s where most of the destinations are. Even bicyclists who prefer not to ride in heavy traffic have to deal with arterials occasionally just to get where they want to go, so it is important to have safe facilities to get them through even those two blocks. In some towns designed without a sufficient street grid arterials become the ONLY way to get from point A to point B, so in those cases accommodation is a necessity. Finally, I’ll second the already made point that people will bike on busy streets whether there is infrastructure for them or not, so why not cover all the bases and insist on well designed accommodation which provides physical protection from motor vehicles while also helping to calm traffic down to legal speeds, which is a safety win for everyone? Even good bike infrastructure is relatively cheap when compared to almost any other types of transpo projects, so there is no real scarcity of funding to get things done, just a scarcity of people willing to demand them. Not to belabor the point, but nobody here is against “well-designed accommodation which provides physical protection from motor vehicles while also helping to calm traffic down to legal speeds”. But the bike lanes on MLK don’t provide any “physical protection from motor vehicles”, unless you believe that white paint on asphalt will stop a car from hitting a bike. And they don’t calm the street; as noted, this street doesn’t have traffic, yet DOT maintained three lanes of car traffic in each direction. And there are no destinations on that stretch of road that aren’t just as easily accessed via the parallel route. And they didn’t stripe “both” alternatives; they only striped the alternative that’s more dangerous, less pleasant, etc. So tell me, where’s the logic here? To be clear, in general I think the 2010 bike plan is great, and I’m not opposed to putting bike lanes on streets in general. I’m just having trouble seeing the logic. I was thinking about this yesterday, and I grew up in a town famous for being bike friendly (Palo Alto). We have tons of bike lanes, bike boulevards, bike-only bridges and tunnels, etc. But you know what I’m pretty sure you won’t find in Palo Alto: a single bike lane on a street with more than one lane of car traffic in each direction. I’m pretty sure there’s not one, and if there is one somewhere in a part of town that I haven’t been to, it’s the exception that proves the rule. I’d say we are in agreement on most points, and I think what it comes down to is that we are both in favor of bikeways in arterial streets as long as the design is right. I’m not familiar with the stretch of MLK you referred to, but it basically sounds like a missed opportunity for a road diet. Bringing the street from three lanes down to two each way would have opened up the opportunity for a wide bike lane with a buffer zone between both moving traffic and parked cars. If there are not many curbs cuts there then it would have also been an opportunity for a parking-protected bike lane, putting cyclists to the right of parked cars. If the latter option was too expensive then it could be implemented in stages with the road diet as a placeholder. I’d also mention that speed limits above 30mph are always inappropriate and unnecessary for non-freeway, urban streets where mixed traffic is expected. I can’t understand how streets get designed and signed for higher speeds anyway, as all it does is encourage drivers to gun it to the next red light. I live in the SF Bay Area and a few cities around here have NO streets signed above 30mph, and they manage just fine. Regarding Palo Alto, it is a very bike friendly city but the network does benefit to a large degree by the fairly cohesive street grid that many cities do not share. Also, there are people biking on the arterials in Palo Alto with no specific accommodation even with the neighborhood routes nearby, mostly because the arterials are much more efficient by their nature. Maybe other cyclists don’t notice, but as someone who stops at all signs and red lights I find my rides to be much quicker when avoiding the calmer neighborhood routes. The LAPD report is incorrect. There is no bike lane on Vine Street. I verified this yesterday when I rode past the intersection of the collision. The problem in this case is sharrows on a street with rapid traffic, few lights, and a right lane too narrow for both cyclist and vehicle. @ Robert Prinz: Yes it was a missed opportunity. I think there may not be single driveway across the entire stretch. Some of it has business lanes. I can almost guarantee you that nobody would’ve complained no matter how many lanes they removed from that stretch. There’s a huge vacant lot where Santa Barbara Plaza used to be, so maybe once they develop that there might be more of a constituency for car traffic, but right now, it’s just far wider than it needs to be. Re: bikes on arterials in Palo Alto, that’s not really true in my experience. The streets with multiple lanes in each direction in Palo Alto are generally set up as sort of “expressways” which are only slightly less inhospitable for a bike than a full-on freeway. I guess it basically comes down to, I would think that we should make a policy that recognizes the inherent danger of mixing bicycles and faster-moving car traffic on the same roadways, and apply treatments that radically reduce the risk of collisions in such situations one way or another.